Anthony Bourdain. En crudo: la cara oculta de la gastronomía. Barcelona, RBA, 2012, 336 pages. Translated by Marta Pino Moreno. ISBN: 978-84-9006-209-8. 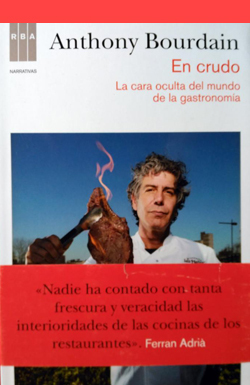 Spanish translation of the original title: Anthony Bourdain. Medium Raw. New York: HarperCollins, 2010. Published in Spanish by RBA.